It's hard to see, but my bald head is in the far back right in the white shirt. 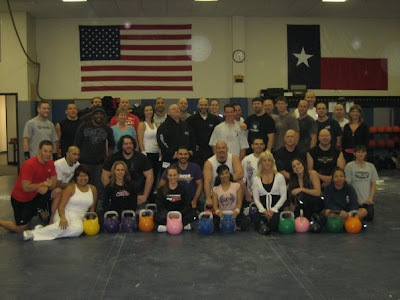 Last weekend I had the honor of instructor assisting at the Dallas IKFF CKT Course. I also had some great Kettlebell fun by continuing my practice. After this I felt something in my right trap and rhomboid (shoulder blade area) that just cramped up and hurt whenever I turned my head left. So I took my father's advice whenever I hurt myself as a child. He would say something to the effect- let's say if I hurt myself and it hurt to make a fist- "Then don't make a fist". So I did my best to not turn my head left. Yeah! So that didn't really work so well. I decided to take the 2 days off after the cert and get massages when I normally would be practicing. That definitely made a difference. Now I usually take Thursdays off, but because of my shoulder issue leading to 2 days off too many I decided to work straight through this week and I actually feel great for doing so. I'm thinking of seeing how a 6 day training week looks and feels like. 10 Min. Long Cycle @ 2 20kg and various reps per minute. I decided to up the pace a bit and start off a touch faster and then finish strong. Overall my grip held out fine and I now know I can bring up my overall pace for the 10 minute sets to a solid 5rpm at least. I rested the same amount of time it took me to sprint the distance. Then I just jogged a final quarter mile.